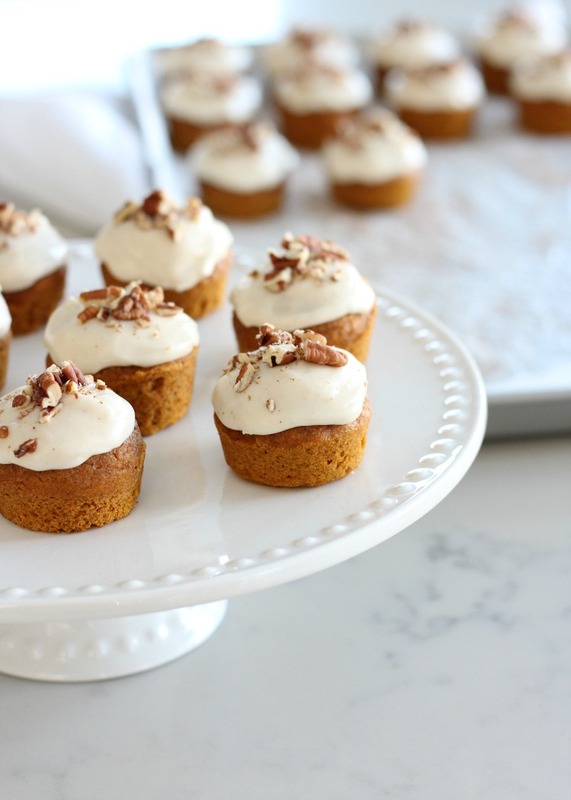 Mini pumpkin spice cupcakes with maple cream cheese frosting are a delicious fall sweet treat the whole family will enjoy. Made from scratch, still easy! Hello, everyone. 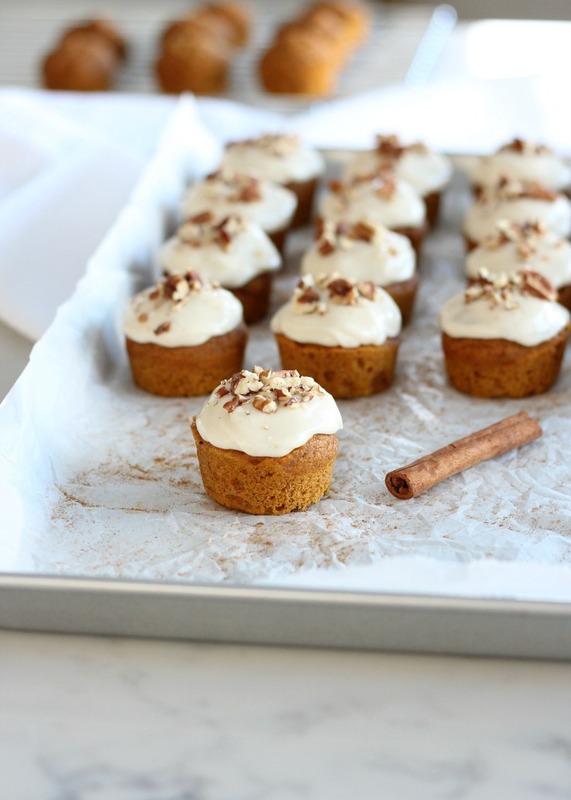 I shared a sneak peek of these pumpkin spice cupcakes on Instagram last week and so many of you oohed and ahhed. Yes, they’re pretty fantastic! Although baking is something I enjoy anytime of the year, fall is definitely my favourite of all. In my mind, October calls for all things pumpkin. 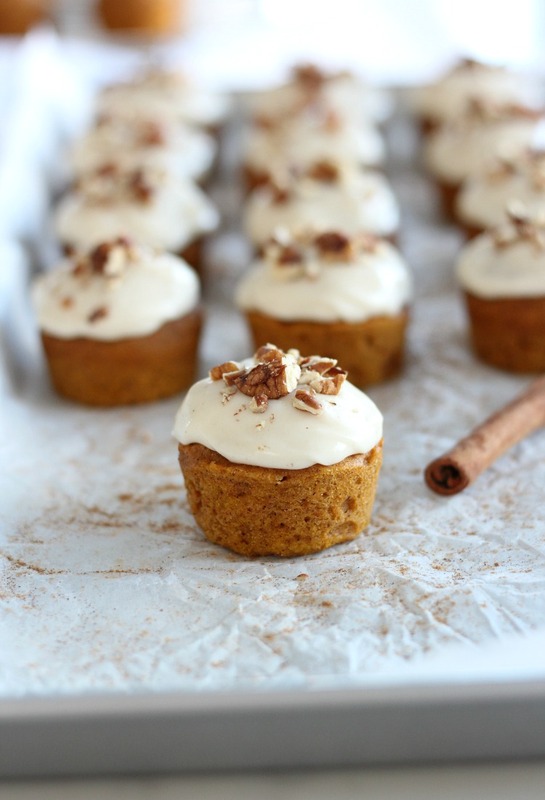 If you’re a huge fan of this flavour too, you’re going to love this delicious recipe for mini pumpkin spice cupcakes with maple cream cheese frosting. 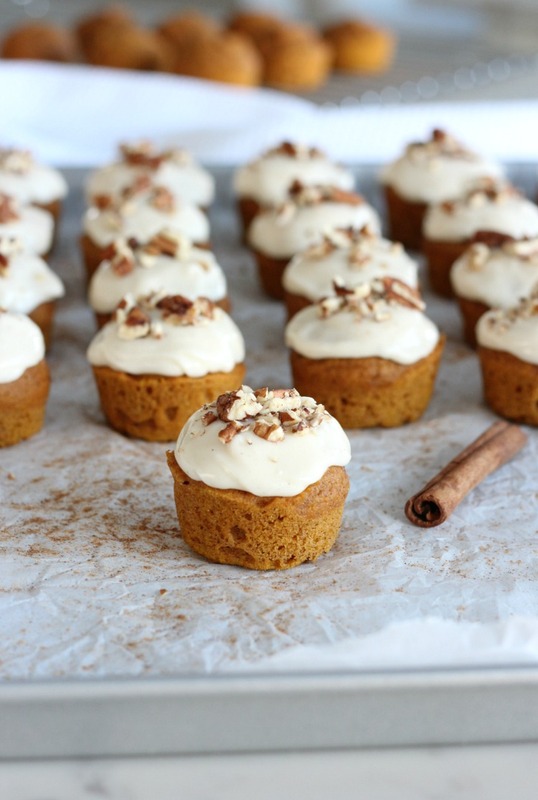 In the past, I’ve made these pumpkin spice cupcakes in regular size. This time around, I decided to switch things up and make a mini version for 2 reasons. One, they’re a better option when you’re craving something sweet but don’t want to indulge too much. Two, I found these cute vintage Bake-Rite tinware pans at the thrift shop and was eager to use them. 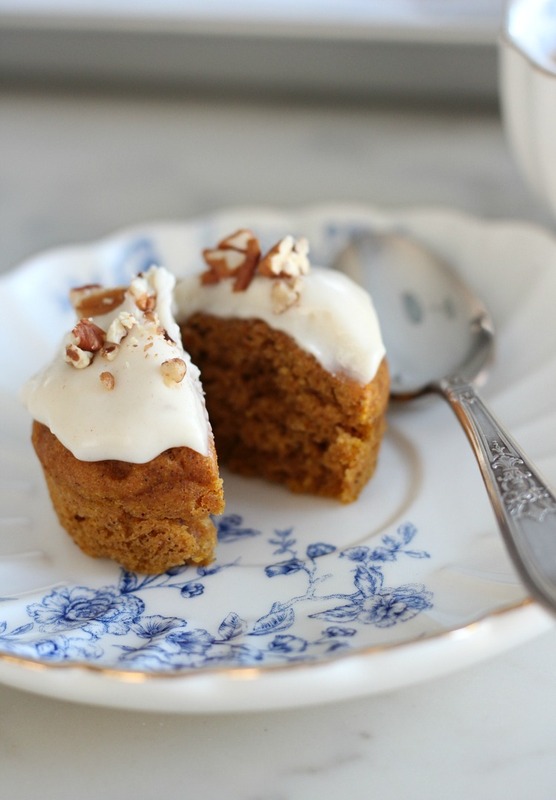 I love baking with pumpkin because it keeps everything so moist. Of course, it’s a healthy ingredient too. And the rich flavours of cinnamon, ginger, nutmeg, allspice and cloves are the perfect complement. Classically fall. Can a cupcake give you a hug? This one feels like it could. So, what makes the frosting so yummy anyway? I love the salty and sweet combination with a hint of spice. Then, the crunchiness of the toasted pecan topping takes it over the top. So tasty! Of course, they’re downright delicious with a cup of coffee or tea. I like to savour every nibble. My boys, on the other hand, have them down in two bites. Then, they look at me with puppy dog eyes for another. That’s the way they all are, right? Whip up a batch for your next fall party or pop them into the freezer. Enjoy! Use canned pumpkin puree, not pumpkin pie filling. The frosting recipe is enough for a double batch of cupcakes (or spread it on something else!). Mini cupcake/muffin pans can vary in size, so see recipe notes for yield and baking time variations. These cupcakes can be frozen and thawed to enjoy later. 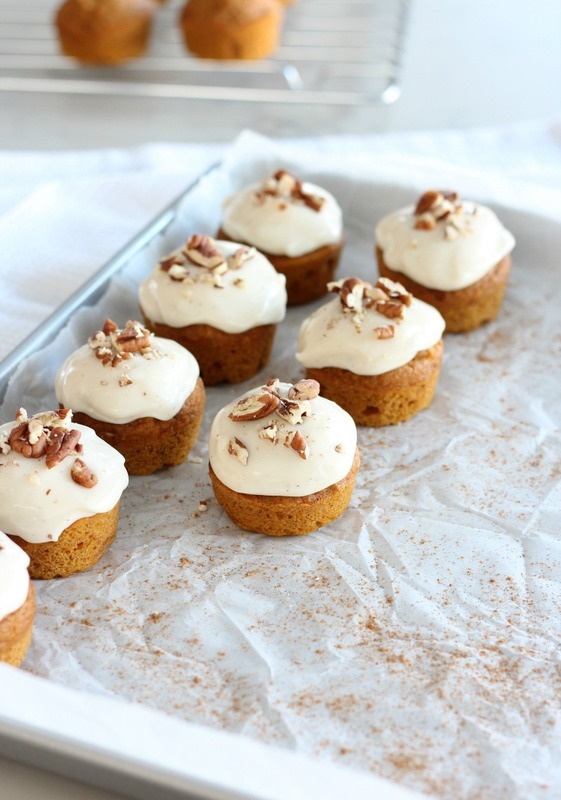 Looking for other pumpkin spice treats? 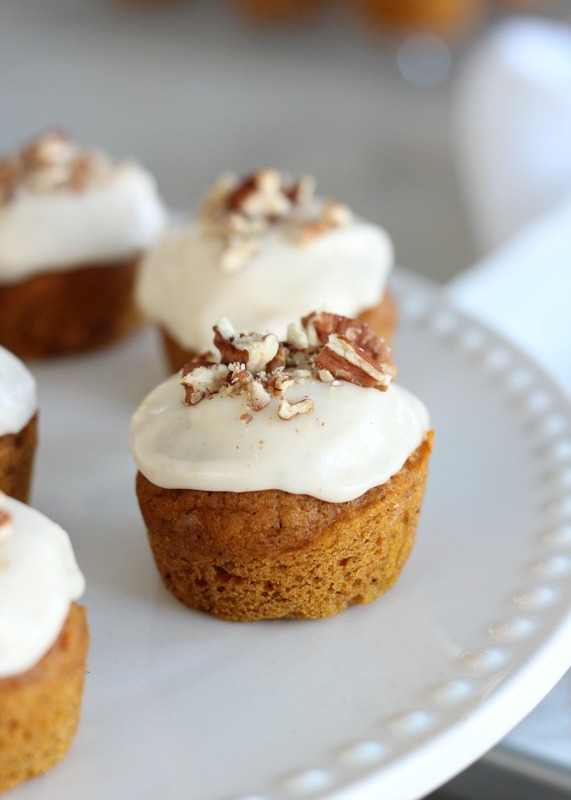 Check out these recipes for pumpkin cake, pumpkin oat muffins and pumpkin pie steamers. 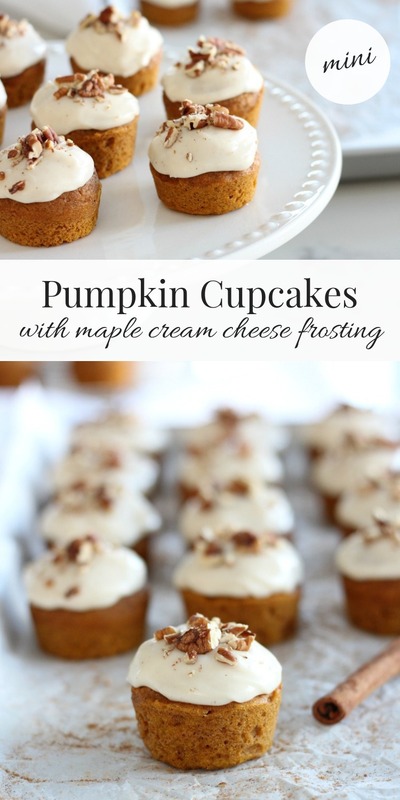 A delicious fall sweet treat the whole family will enjoy. Made from scratch, still easy! Preheat oven to 350°F. Grease or line 16-20 mini cupcake cups (see notes). Set aside. In a medium bowl, whisk together pumpkin puree, melted butter, sugar, maple syrup and egg until well blended. Sprinkle in flour, pumpkin pie spice, cinnamon, baking soda and salt. Stir until just combined with no white streaks remaining. 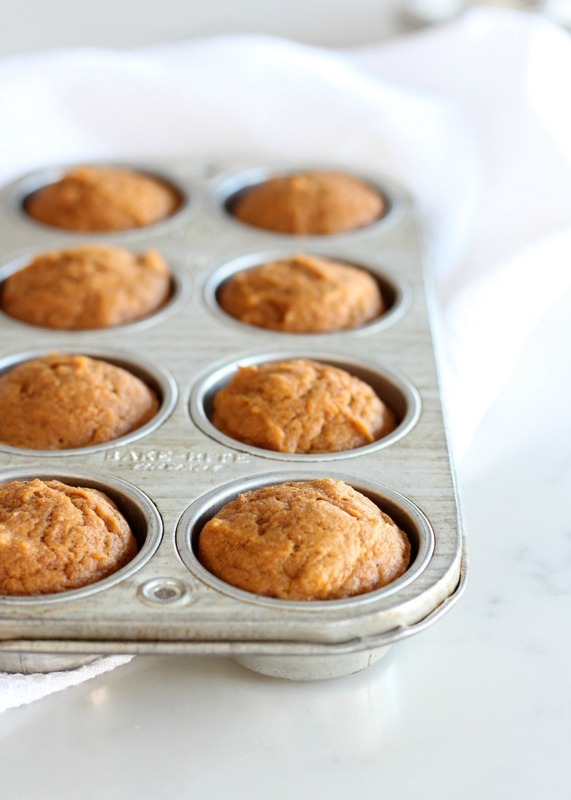 Using a kitchen scoop or spoon, transfer to cupcake pans (wells should be about ¾ full). Tap bottoms gently on kitchen counter to spread out evenly. Bake for 13-17 minutes (see notes) or until cupcakes spring back slightly when pressed lightly. Allow to cool in pan for about 5 minutes, then transfer to cooling rack. Mix the softened cream cheese, butter, vanilla and maple syrup on high speed in the bowl of your stand mixer (a hand-held mixer works for this job too). Add the powdered sugar, one cup at a time, scraping down the bowl between each addition to make sure it's incorporated evenly. Once the cupcakes have cooled completely, pipe or spread the frosting on top. Optional- Sprinkle each cupcake top with toasted pecans. The vintage Bake-Rite mini cupcake pans I used measure 2" wide by 1" deep. This recipe makes 16. Bake for 15-17 minutes. Most mini cupcake pans sold today measure 1½" wide by ¾" deep. This recipe will make more cupcakes (about 20), with less baking time (13-15 minutes). Now for more fall recipe ideas! These are just the perfect size to go with a cup of coffee. And they are soo cute! Thanks for sharing Shauna and being a part of the blog hop. These look so amazing. Thanks for the recipe. I love pumpkin spice! These cupcakes look amazing!